"[Insert sarcastic remark from teacher here...]"
Is it any wonder that we become anxious when faced with the prospect of helping our own kids with their maths homework? Here we explore some of the reasons why parents might dread maths and demystify some of the primary maths topics we fear most. The first reason for fear I&apos;m going to call &apos;The Confidence Trap&apos;. It&apos;s powerful, invisible and you can happily live with it all your life. You can tell you&apos;re in the confidence trap if you hear yourself say &apos;I&apos;m useless at maths&apos;. The truth is, the vast majority of people who say this aren&apos;t useless at maths. In fact, they&apos;re probably okay but they just don&apos;t know it. My friend thinks she&apos;s &apos;crap at maths&apos; (her own words), but wow - you should see her work out special offers at the supermarket! That&apos;s different, I hear you say, but it isn&apos;t. In fact, working out shopping offers is just maths - and it&apos;s not far off GCSE level. The confidence trap can be harmful when you become a parent because it&apos;s very easy to inadvertently pass it on to your kids. It would be a great shame if your kids thought it was okay to &apos;be useless at maths&apos; before they reached their potential. 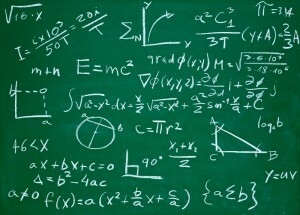 We all know how many careers need maths so opting out early on could seriously damage their future options. Maths education has changed over the past 30 years and that makes our generation feel a bit out of the loop - they even renamed it &apos;numeracy&apos; to add extra confusion! 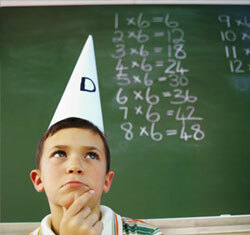 One obvious aspect that&apos;s changed is the way our kids are taught some simple arithmetic skills. The changes came about because educators felt operations like long multiplication and division were too unclear and that learners were simply following the various directions to get the answer without any sense of how the answer came. One thing that unsettles some parents about helping with maths homework is new topics that they didn&apos;t study at school - data handling, sets and some aspects of shape and measurement are relatively new to the curriculum. The thing you have to bear in mind is that these topics are usually taught pretty well in class. So if you don&apos;t know the difference between a rhombus and a cuboid the chances are you won&apos;t need to. What&apos;s important is that your child has a really solid grasp of arithmetic, particularly mental arithmetic, which is something you can help with. Knowing what to teach your kids and in what order is difficult for parents. If you&apos;re just helping your kids with homework this isn&apos;t a concern because the teacher has this in hand. If however you need or want to go further in helping your child you&apos;ll need to find a plan. Some maths topics come after others, so learning them out of order can cause problems - but don&apos;t worry, help is at hand! In Komodo we&apos;ve created a maths learning app for ages 5 to 11 that provides parents with an effective, rewarding and enjoyable way to help their children master maths at home. It complements school studies by focusing on essential skills, like mental arithmetic, that really benefit from extra practice. Importantly, we realise that learning at home is different to school, so we&apos;ve designed a few clever ways to ensure you can keep your child motivated and you&apos;re always in the loop with what&apos;s being studied - even when you&apos;re still at the office. On signup, each child does a short diagnostic test and a qualified maths teacher assigns an individual learning plan based on your child&apos;s attainment and needs. If you would like to check where you fall in terms of numeracy skills, you can take the National Numeracy Challenge and build your skills for free in a friendly way. About Komodo - Komodo is a fun and effective way to boost primary maths skills. Designed for 5 to 11-year-olds to use in the home, Komodo uses a little and often approach to learning maths (15 minutes, three to five times per week) that fits into the busy routine. Komodo users develop fluency and confidence in maths - without keeping them at the screen for long.